In the current climate of increasing complexity and functional integration in all areas of engineering and technology, stability and control are becoming essential ingredients of engineering knowledge. Many of today’s products contain multiple engineering technologies, and what were once simple mechanical, hydraulic or pneumatic products now contain integrated electronics and sensors. Control theory reduces these widely varied technical components into their important dynamic characteristics, expressed as transfer functions, from which the subtleties of dynamic behaviours can be analyzed and understood. 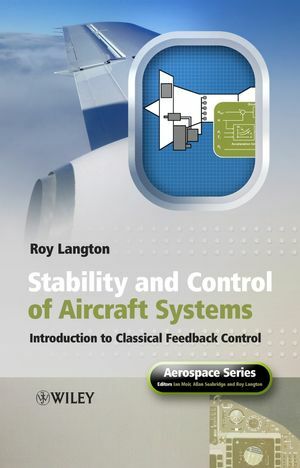 Stability and Control of Aircraft Systems is an easy-to-read and understand text that describes control theory using minimal mathematics. It focuses on simple rules, tools and methods for the analysis and testing of feedback control systems using real systems engineering design and development examples. Stability and Control of Aircraft Systems provides both the seasoned engineer and the graduate with the know-how necessary to minimize problems with fielded systems in the area of operational performance. 1.5 Primer on Complex Numbers. 2.1 The Generic Closed Loop System. 2.2 The Concept of Stability. 2.3 Response Testing of Control Systems. 2.7 Aircraft Flight Control System Example. 2.8 Alternative Graphical Methods for Response Analysis. 3. Control System Compensation Techniques. 3.3 Applications of Control Compensation. 4. Introduction to Laplace Transforms. 4.1 An Overview of the Application of Laplace Transforms. 4.2 The Evolution of the Laplace Transform. 4.2.1 Proof of the General Case. 4.3 Applying Laplace Transforms to Linear Systems Analysis. 4.4 Laplace Transforms – Summary of Key Points. 5.1 Definition of Nonlinearity Types. 6.2 The Digital Computer as a Dynamic Control Element. 6.3 The Stability Impact of Digital Controls. 6.4 Digital Control Design Example. 6.5 Creating Digital Control Algorithms. 7.1 An Overview of the Material. 7.4 Laplace Transforms and Root Locus Techniques.